NEW YORK – Dutch composer Michel Van der Aa (b. 1970) is best known for his imaginative and formidably-constructed multimedia works that incorporate both film and electronics. Notable among these are the operas Blank Out (2016) and Sunken Garden (2012), as well as a music theater work based on Portuguese writer Fernando Pessoa’s The Book of Disquiet (2008). Even pieces for acoustic ensembles, such as the clarinet chamber concerto Hysteresis (2013), have frequently incorporated electronics as part of their makeup. 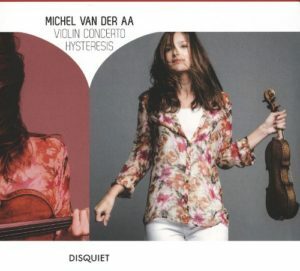 Thus, when Van der Aa composed his Violin Concerto (2014) for soloist Janine Jansen and the Royal Concertgebouw Orchestra, the absence of electronics was significant. (Interestingly, after the success of the concerto, his follow up piece for orchestra, Reversal (2016), also abstains from the electronic domain). However, even in the analog realm, Van der Aa incorporates a sound world that acknowledges his interest in decidedly non-classical elements. The score indicates that the solo violin part should be played with the vibrato, portamento, and usual techniques common to the instrument in contemporary concertos. The accompanying strings however, are asked to refrain from using vibrato in sustained passages, creating a kind of sine tone effect. Various styles are incorporated in the solo part, from bluegrass fiddling to more angular contemporary passages. Other aspects of the orchestration hearken to pop music terrain: near the end of the first movement, for instance, a climax approaches house music in its boisterous brass and percussion. On March 13th, joined by Jansen, the Philadelphia Orchestra, conducted by Yannick Nézet-Séguin, delivered an energetic and assured performance of the concerto at Carnegie Hall. The violinist played with the supreme confidence of a soloist who has endeavored to make a work entirely her own. With its variety of solo demeanors, both shaded and nuanced and explosive and mercurial, Van Der Aa’s Violin Concerto seems the ideal vehicle for Jansen’s multi-faceted artistry. The Philadelphians matched her playing with equal confidence, with strings sensitively taking up the “sine tone” accompaniment of the sostenuto passages and winds, brass, and percussion gamely taking on roles in the electronica mimicry of wide swaths of the piece. Interpretively speaking, Jansen and Nézet-Séguin were on the same page throughout. In a dramatic conclusion to the piece, the violinist played her last gesture nose to nose with the conductor, eliciting surprised exhalation and then sustained applause from the audience. Sergei Rachmaninov’s Second Symphony is one of my favorite of the composer’s works and I have seen a number of performances of it in concert. While I might quibble here or there with Nézet-Séguin’s tempo choices, the conductor’s tendency to press ahead during the potentially “schmaltzy” moments of the piece rendered it free of several layers of sentimental “varnish:” still emotive yet utterly fresh-sounding. The Philadelphia Orchestra’s strings are justly renowned and were exemplary here, but the winds, brass, and percussion each contributed in both spotlight and ensemble moments as well. Thus, it was a touching exchange onstage when the conductor insisted on walking out to each of them in turn, bestowing embraces and well-earned praise. Jansen and the Royal Concertgebouw Orchestra, conducted by Vladimir Jurowski, have recorded Van Der Aa’s Violin Concerto for Disquiet Media. It is paired with the aforementioned Hysteresis, performed by Amsterdam Sinfonietta, directed by Candida Thompson, with Kari Krikku as soloist. The performances are detailed and evocative, giving an excellent sense of the composer’s approach to ensemble works. One hopes that both the recent high-profile performances of the Violin Concerto and this persuasive recording prove inviting to other soloists and ensembles: Van der Aa’s work is worthy of wider currency.